I picked this episode because Heather Menzies, who would begin filming Logan’s Run a few months after this one wrapped, is in it. It’s a counterfeiters in turtlenecks episode. This time, Steve goes undercover as an oil rigger. It also features Bruce Glover (Mr. Wint from Diamonds are Forever) as a crooked sheriff, and Steve wears one of those late seventies coat-vest things that is identical to one that I had when I was ten. The most interesting thing about this episode to me is a curious inversion of a very similar situation in a 1973 Doctor Who story called “The Green Death,” but I’ll wait until we get to that episode in a couple of months to discuss the strange similarity. But the most interesting thing for our son was the sudden realization that Oscar Goldman must be rich. “How do you figure that,” I asked. “Well, Oscar didn’t pay for that himself. The OSI would have a very large budget which is paid for by taxes…” We sometimes pause the program that we’re watching for a little backstory, but this time it went off on a few tangents! 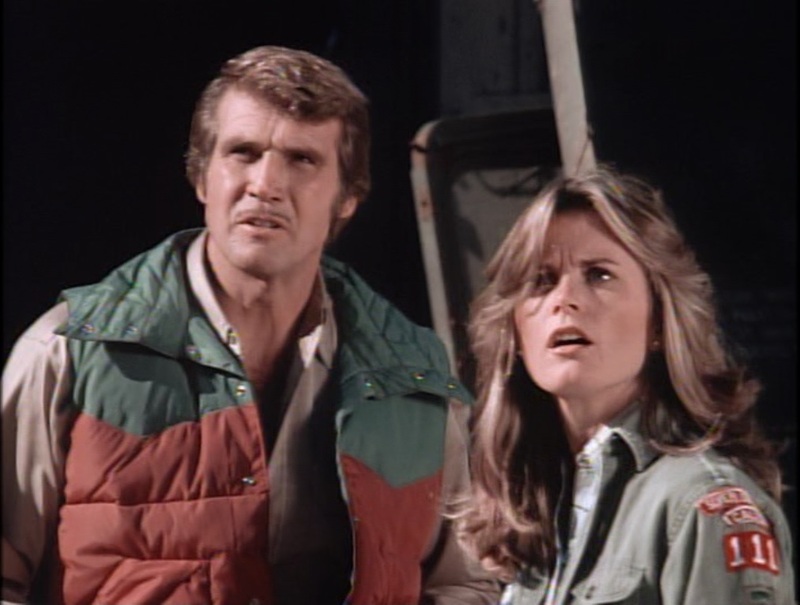 Anyway, The Six Million Dollar Man and The Bionic Woman continued their seasons for a couple more months, and then Universal got the wild surprise that ABC wasn’t going to renew both of them. Apparently, after suggesting and championing the spinoff in the first place, ABC’s head, Fred Silverman, decided that the network didn’t need so many superhero shows and didn’t need three different action-adventure series with female leads, so Wonder Woman and The Bionic Woman were both axed, while Charlie’s Angels continued into the 1977 season. At the same time, ABC also wanted to cut costs, and popular sitcoms like Three’s Company were a whole lot cheaper than Wonder Woman was. NBC picked up The Bionic Woman pretty quickly, but sadly the two networks couldn’t agree to work together and do any more crossover adventures. But it looks like each show had a few promising tricks up their sleeve, which we’ll look at down the line. That’s all the Bionic action for now, but stay tuned! Steve and Jaime will be back for more bionic blogging in November!